It’s been an interesting few days around our neck of the woods! Last Tuesday, I did what I always do. Took Cannon to town for his Occupational, Physical, and Speech Therapies…..followed by a trip to the allergist for my weekly allergy shot. When we rolled into our driveway, the boys immediately began begging to go to the park in our neighborhood. So, I dropped my purse and we set off on foot. We had had a lot of wind the past couple of days so it was a little on the cool side but not actually cold. Nice….really. We didn’t do anything too strenuous……just swing mostly. The boys were being lazy and not pumping their legs so Mommy was doing all the work pushing them. About 20 minutes in, Cannon fell and skinned his knees and elbows. Nothing too major but we needed to clean him up. So, we walked back home and I sat him in a chair right by the front door to do this. Townsend walked into the next room. When I was just about finished playing nurse, I heard Townsend say something. “Mommy, my tummy hurts.” And it was just the way he said it. I knew he meant it. I jumped up and was walking quickly into the living room. As soon as I got a visual of him, my walk turned to a run. He started to say it again….”Mommy, my t……” I made it to him just as he dropped. I screamed for Mark who was taking a nap. I cradled my baby as his eyes began doing all kinds of crazy movements and his whole body went as limp as a wet noodle. Then, I saw all white as his eyes rolled back into his head. And he wouldn’t wake up. It scared me to death. Mark got 911 on the line and I ran with Townsend outside to meet the ambulance. A Sheriff’s Deputy along with several firefighters and paramedics responded. They did all kinds of vitals and during this he began to open his eyes. He was VERY groggy and had a very lost look in his eyes. When they determined he was stable, we jumped on the ambulance and headed for the hospital. You may remember that Townsend did this 2 years ago. And I will say that this time was much milder. Then, it took him over an hour to come to at all AND he had a second seizure in the ambulance and required intense medication to stop the seizure. It was the worst day of my life. And it just so happened to be my birthday. And just like this time, there was no warning. No reason. No fever, low blood sugar, exhaustion, dehydration….nothing. Townsend got much more alert and talked some in the ambulance. It was a long ride. And it took longer to get there due to lots of construction in town. When we arrived, a lot more vitals and such were done and someone came in to have us sign admittance paperwork. 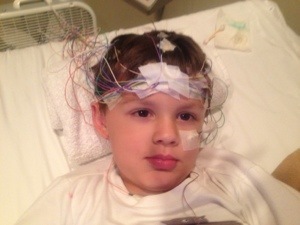 We figured that just like last time, he would head upstairs and check in…..with an EEG and CT to follow. But they never did either. 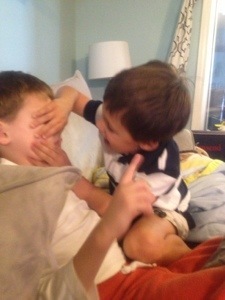 Because he didn’t look as bad by this point…..they decided to just watch him. His only lingering symptom was that he was pretty mellow and his speech was a little drawn out. A vast, vast improvement over the last time this happened. Eventually, after about 5 hours, they decided to send us home. With an EEG scheduled in our neurologist’s office a couple of days later. We arrived home around 10 p.m and Townsend most certainly bunked with us. The next day was Wednesday. I deemed it “Movie and Relaxation Day.” No preschool for Townsend. We watched lots of movies and laid around. Staying chilled out most of the day. Except for a quick run to town to have Townsend looked at my his pediatrician. He passed his neurological exam and we were told not to let him shower or swim alone. And not to let him ride his bike….until we figure out what caused his episode. Wednesday night was not like the typical. Townsend’s EEG was scheduled for the next morning and he had to be sleep deprived for it. We decided to keep him up as long as we could and then let him sleep the allotted 4 hours. 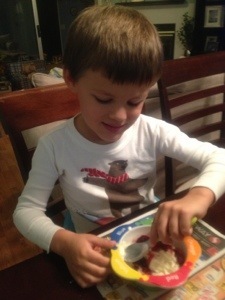 We passed the time by doing art projects, making his derby car for the AWANA Grand Prix this weekend, eating ice cream, doing magic tricks, and watching movies. 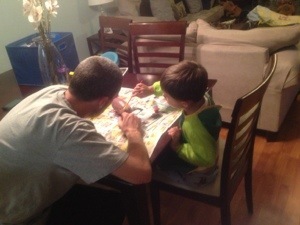 He lasted until midnight….got a few hours sleep…..and then got up to do more of the same (minus the ice cream). The test went ok. It was done at the neurologist’s office. I thought that it would be in a quiet part but no such luck. There was regular office noise and then some. Townsend did not even close his eyes, much less go to sleep. 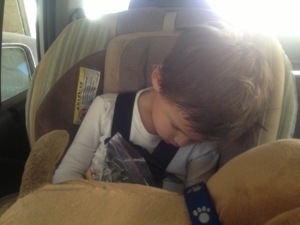 (But of course, he was asleep within 5 minutes of being in the car on the way home). We are not sure if his failure to fall asleep will affect the results. I guess we will find out. Today marks the end of the 4th business day so we are hoping that we will hear something by tomorrow. The waiting is kind of hard…..
We will keep you posted. God bless you ALL! Wow. Your family is in my prayers again… and always! Congratulations to Cannon! 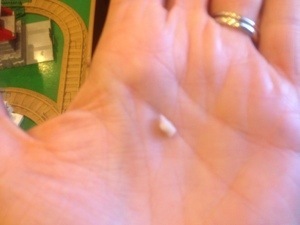 Little Rabbit’s Loose Tooth is my favorite tooth fairy story. 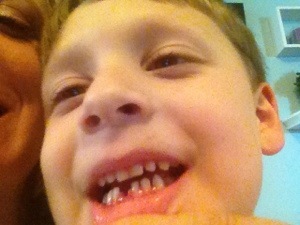 It is sure to be just the beginning of loose teeth at your house with two growing boys! I will definitely check out the book you mentioned Jenny! 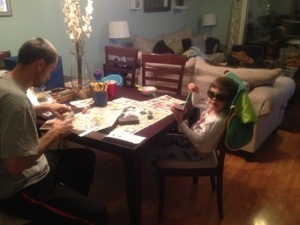 Not sure he was totally getting the whole Tooth Fairy concept! Thank you so much for your prayers and also for virtually walking with us and helping with our Autism Walk Fundraiser! I look forward to when the 31 products come in! I will use it as an excuse to come visit! 🙂 I am so grateful for your constant support!